A TECHNOLOGY company that played an influential role in targeting voters during the Brexit referendum campaign was also used by the DUP in a recent election in Northern Ireland, The Detail can reveal. AggregateIQ is a Canadian data analytics company that uses online advertising and social media to reach potential voters. Its website states that it specialises in “audience persuasion, audience analysis and online engagement and intervention”. Official records from the EU referendum show that the organisation received more money than any other company, including £3.9million from the official Leave campaign. AggregateIQ also received a further £757,750 from other officially registered campaigns backing Brexit – including the DUP which paid the company £32,750 in the lead up to the June 2016 EU referendum. Now, in a separate development, a receipt seen by The Detail shows that the DUP paid AggregateIQ £12,000 as part of its March 2017 Northern Ireland Assembly election campaign. Over £3,300 of this was paid to AggregateIQ for services provided to the campaigns of three DUP candidates, while a further £8,600 was paid for services provided to the party. Given AggregateIQ’s prominent role in the referendum campaign, The Detail asked the DUP for information on the work the company carried out in the March 2017 Stormont election, but the party did not respond. We also contacted AggregateIQ with similar queries but it declined to comment. Information on election candidates' spending is recorded on their electoral return forms. These forms are publicly available by requesting access from the Northern Ireland Electoral Office. The Detail was able view the full electoral return forms of all DUP and Sinn Féin candidates who ran in the March 2017 Northern Ireland Assembly election. Only the forms of DUP candidates Peter Weir, Christopher Stalford and Adrian McQuillan contained any reference to AggregateIQ. The same invoice from AggregateIQ was contained in all three of their forms showing that a total of £12,041 ($14,250) was paid to the company on March 8th 2017. On their electoral return forms Christopher Stalford and Peter Weir described the services provided by AggregateIQ as “social media advertisement”. The full AggregateIQ invoice stated that services paid for by the DUP related to “General GOTV”. This may relate to the campaigning phrase "Get Out The Vote". The snap election in March this year came against a background of major political tension which focused on the DUP's handling of the multi-million pound Renewable Heat Incentive (RHI) scheme. The hotly contested election saw unionism lose its majority status at Stormont for the first time. The RHI scheme is now the subject of a public inquiry. 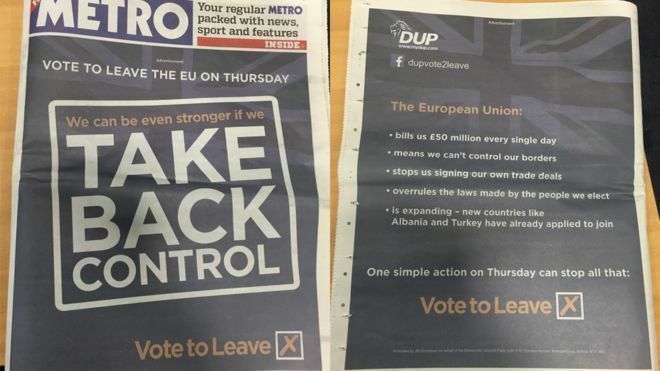 The DUP’s Brexit campaign came to prominence on the eve of the referendum in June 2016 when it spent £282,000 on an advert reading "Take Back Control - Vote To Leave" in the Metro newspaper which circulates in Britain but not in Northern Ireland. In February this year, a week before the assembly election, the Electoral Commission published information on all EU referendum campaign expenditure. This revealed that the DUP had spent £425,000 on its Brexit campaign. On the same day as the commission's discolsure the DUP voluntarily revealed that a pro-Brexit group, the Constitutional Research Council, had donated £435,000 to the party. An investigation by The Detail subsequently revealed that the DUP had asked the Electoral Commission not to publish the information on its Brexit campaign spending before the assembly election. While the DUP’s advertisement in the Metro sparked headlines, The Detail later reported on how the DUP also paid almost £100,000 of its Brexit spending to an English branding company for 100,000 window stickers, 50,000 badges, 15,000 plastic boards, 5,000 bags and 7,000 t-shirts. On the wider issue of spending in the referendum campaign, it also emerged that AggregateIQ financially benefitted in the lead up to the June 2016 EU referendum. Information on campaign spending released by the Electoral Commission showed that the Vote Leave campaign had spent £3.9million, more than half of its official £7million campaign budget, on services provided by AggregateIQ. Three other affiliated Leave campaigns: BeLeave, Veterans for Britain, and the DUP, had spent a further £757,750 on the web tech company. Meanwhile, the Electoral Commission is currently investigating the spending return of Leave.EU, one of several registered Brexit campaigns. In May this year the Information Commissioner’s Office confirmed it was investigating the wider use of personal data for political purposes, including during the EU referendum campaign. Meanwhile, The Detail has today also reported on new questions over the finances of Stormont's political parties. Click here to see our previous coverage on the rules surrounding political donations in Northern Ireland.